MACC urged to treat Najib fairly. Remember Theresa Kok, Rafizi ?Where were you then? 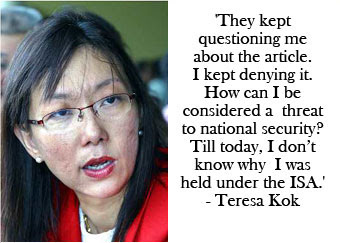 PUTRAJAYA: The decision to arrest and detain Seputeh Member of Parliament Teresa Kok Suh Sim in 2008 under the now repealed Internal Security Act (ISA) 1960 was unlawful, the Court of Appeal here heard today. Kok's counsel, S.N. Nair, submitted before a three-member bench that there were overwhelming evidence negating allegations against his client, but the police proceeded to arrest and detain her. He said the police should have instead call her for questioning to inquire about the allegations against her without effecting the warrant of arrest on her. Nair said the High Court judge did not weigh whether the respondents had produced sufficient particulars and material evidence as proof of Kok's activities to justify her arrest and detention under Section 73 (1) of the ISA.